The following is a select list of free educational programs available at The Ripa Center. 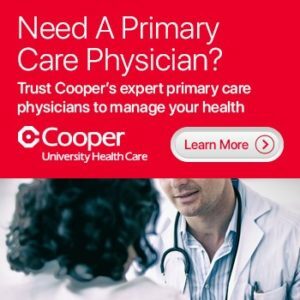 Preregistration is required for all Ripa programs For full class descriptions or to register, visit events.CooperHealth.org or call 800.8.COOPER (800.826.6737). Thursday, February 21, 2019 from 6 p.m. to 7 p.m.
Do you often feel stressed or worried? Are you feeling overwhelmed and constantly tired? Feel like your mind is racing or find it difficult to fall asleep? Join David M. Nocchi, MD, FAAEM, Cooper Integrative Medicine for Women, in exploring the concepts of stress and natural ways to help manage life’s challenges including herbal remedies, breath work, meditation, and mindfulness. Tuesday, February 26, 2019 from 6 p.m. to 7 p.m.
Tuesday, April 30, 2019 from 6 p.m. to 7 p.m.
Evelyn Arteche, Cooper Registered Dietitian, will discuss how our diet impacts common complaints such as fatigue, bloating, headaches, junk food cravings, nausea, and more. Join Evelyn to learn how to feel your best and heal your body with food. Tuesday, March 5, 2019 from 6 p.m. to 8 p.m. Learn how to manage your blood sugar levels and reverse prediabetes through realistic and permanent lifestyle changes with Geetha K. Bhat, MD, Cooper Endocrinologist, and Megan Day, Cooper Registered Dietitian and Certified Diabetes Educator. Tuesday, March 12, 2019 from 6 p.m. to 7 p.m.
Join Kimberly Hurley, DPM, Cooper Podiatric Surgeon, for an educational session and surgical demonstration on common female foot issues. Tuesday, March 19, 2019 from 6 p.m. to 7 p.m.
Nicole J. Jarrett, MD, Cooper Hand and Nerve Center Surgeon, will discuss common hand and upper extremity disorders such as carpal tunnel syndrome, texting thumb, and arthritis of the hand. Thursday, March 21, 2019 from 6 p.m. to 7 p.m.
Cooper Gastroenterologists Joshua P. DeSipio, MD, and Tara L. Lautenslager, MD, will discuss common digestive health concerns for women. Symptoms, diagnostic testing, and the latest treatment options for everything from unresolved heartburn to bloating, constipation, lactose intolerance, and more will be covered. Tuesday, April 2, 2019 from 6 p.m. to 7 p.m. Learn about common shoulder problems that affect women. Catherine Fedorka, MD, Cooper Orthopaedic Surgeon, will discuss these issues along with surgical and nonsurgical treatment options. Tuesday, April 9, 2019 from 6 p.m. to 7 p.m.
Join Lioudmila Lipetskaia, MD, MSc, FACOG, Female Pelvic Medicine and Reconstructive Surgeon; and Michele A. Stroud, Pelvic Floor Physical Therapist, for a frank discussion about pelvic floor and sexual health concerns and treatment options. 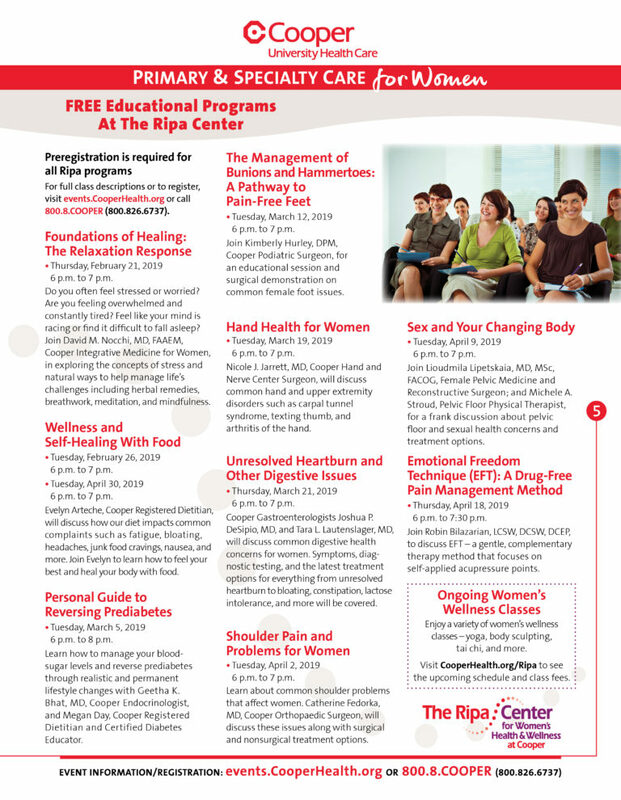 Thursday, April 18, 2019 from 6 p.m. to 7:30 p.m.
Join Robin Bilazarian, LCSW, DCSW, DCEP, to discuss EFT – a gentle, complementary therapy method that focuses on self-applied acupressure points. Enjoy a variety of women’s wellness classes – yoga, body sculpting, tai chi, and more. 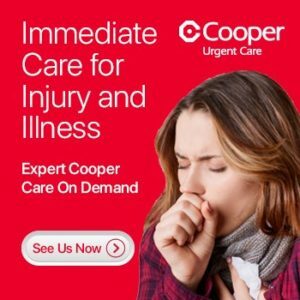 Visit CooperHealth.org/Ripa to see the upcoming schedule and class fees. Copyright © 2019 eHealth Connection.